Estonia is the second oldest (and second youngest), wisest, and “ace student” of the Baltic brothers. 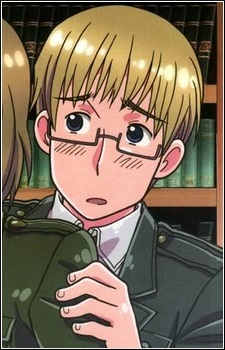 He has dark blonde hair and greenish-blue eyes, which were colored brown in early artwork and were changed to being dark blue in the anime adaptation. One hobby of his is visiting his dear friend Finland and participating in strange Finnish festivals with him, which he seems to enjoy a little too much. The two have known each other for a long time, and are always willing to help the other out. He was once an underling of Russia and was probably the least "tormented" by him out of his brothers. Although the three Baltics eventually broke away from Russia, Estonia was said to be the only one that, in present day, does not rely on Russia too much. His personality is mild, well-mannered, and poised, plus, he is financially secure. He is somewhat self-centered, which results in not very many people giving him much recognition. Estonia is on friendly terms with most of the other countries of the world, and is quite skilled with technology. Over the years, he’s managed to avoid problems and war situations using his mind, wit, and cleverness alone, making Estonia’s beautiful cities and countryside preserved and untouched by other nations. Hidekaz Himaruya once hinted that Estonia's character design is based off of his own appearance, and that, probably due to this, he considers Estonia to be the "coolest" character in Hetalia.